Social psychologist Thomas Pettigrew's pathbreaking research on racism has earned him international honors as well as the admiration of his peers at UC Santa Cruz, who have named him the recipient of the 2008 Distinguished Social Sciences Emeriti Faculty Award. Pettigrew, whose contributions include demonstrating that racism is largely a matter of conformity to social norms and as such can be changed, will receive the award at a luncheon in his honor April 24. "Over the last 50 years, social psychologists have contributed valuable insights into many of our most intractable problems, but few problems exceed racism in the damage it does to individuals and society," said Social Sciences Dean Sheldon Kamieniecki. "By presenting this award, we add the Social Sciences Division to the long list of organizations that have honored Tom Pettigrew." Kamieniecki established the Distinguished Social Sciences Emeriti Faculty Award last year to recognize the contributions of retired faculty. Pettigrew was chosen by a committee of current and emeriti faculty members and students from the Social Sciences Division who evaluated nominations submitted by faculty, staff, and alumni. Pettigrew, who retired from teaching in 1994, has studied intergroup relations for more than five decades, spending the past 20 years focusing on race relations in Europe. Since retiring, he has maintained an active research program and traveled around the world while also remaining involved in campus activities. 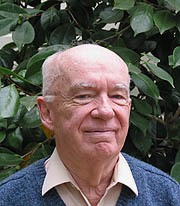 Pettigrew came to UCSC in 1979 after teaching at the University of North Carolina and Harvard University. He was a student at Harvard of pioneering social psychologist Gordon Allport, the pioneer of contact theory, which postulates that prejudice is reduced when people of different races interact with each other. Pettigrew is widely credited with demonstrating that racism is not intractable. Editor's Note: The award luncheon is not open to the public.